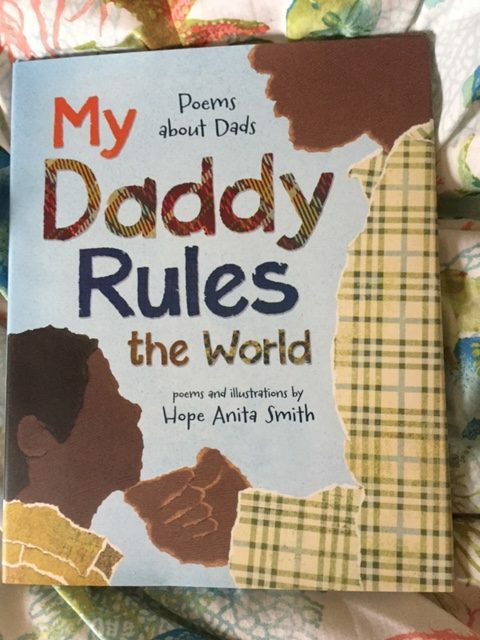 Great Books for New Dads and Dads to be this Father’s Day! 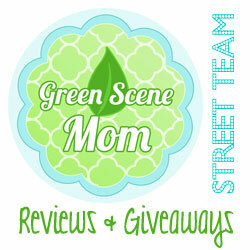 You are here: Home / Media Reviews / Great Books for New Dads and Dads to be this Father’s Day! Chris is the founder of Diaper Dude, a popular parenting brand that was born from the idea that fatherhood doesn’t have to be complicated or uncool, and a proud father of three. Picking up where his first book From Dude to Dad left off, this new guide is filled with humorous takes on fatherhood from the front lines to help new dads master the art of fatherhood. A new Dad can learn how to wrap his baby like a burrito (the art of swaddling) and learn other great things like how to prep for the big day (for new das-to-be). 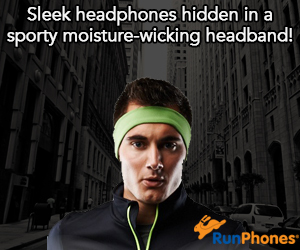 The book is completely full of useful advice, info and fun stories! I highly recommend for all new Dads and Dads-to-be! For readers of Anne Lamott, Brian Gresko and Catherine Newman, Matteo Bussola chronicles the growth of his three daughters, Virginia, Ginevra, and Melania, as well as his own transformation through their experiences in candidly poignant stories and the briefest of glimpses. Sleepless Nights and Kisses for Breakfast is an honest and tender exploration of everyday life that will elicit laughter, empathy, and warm, fuzzy happiness. This was a fun read and I like how it made me laugh out loud! I highly recommend as a gift for Dad this upcoming holiday! About the author: Matteo Bussola is an architect-turned-cartoonist who lives in Verona, Italy with his wife, Paola, and their three young daughters. He writes about his family’s adventures on Facebook, and his posts have gone viral, as they serve as moving reminders to people all around the world to embrace the present and value every moment they share with their loved ones. This is such a cute picture book! Daddies Are Awesome by Meredith Costain and Illustrated by Polona Lovsin has really sweet images! I love Bulldogs, as it is! 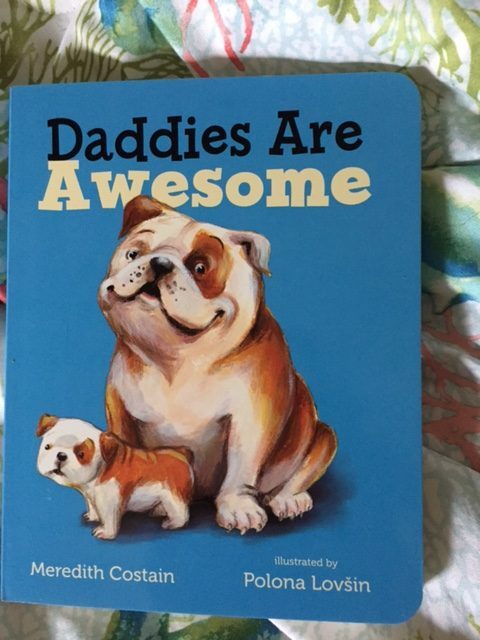 I love how this celebrates all kinds of daddies and if Daddy is a dog lover…he will surely love to read this one with his little guy or girl! 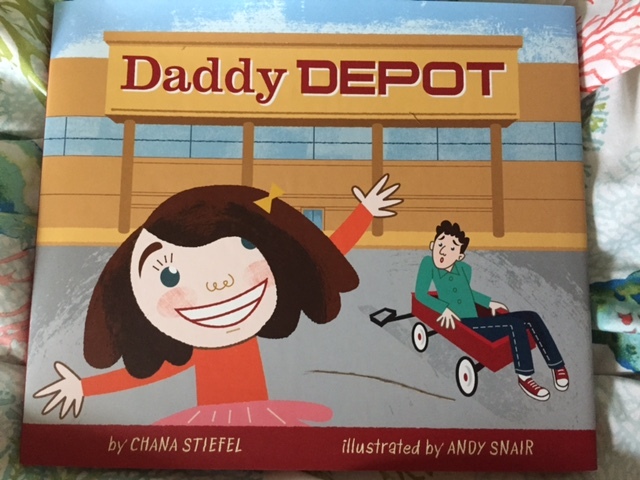 I highly recommend for ages 2-6 and their Dads this Father’s Day! This one is published by our friends at Macmillan Children’s Publishing Group. Another great one from our friends at Macmillan Children’s Publishing Group. Daddy Depot by Chana Stiefel and Illustrated by Andy Snair is just a fun book! Ever thought about shopping for a New Dad? (But, you really know you have the best Dad!) This is a charming story and is loads of fun to read out loud. Guaranteed to make you smile! Perfect for ages 2-5 and their Dads too! My Daddy Rules The World by Hope Anita Smith is also published by Macmillan’s Publishing Group and shows the special relationship between father and child. I love the moving, powerful poems and recommend this one for ages 4-9. 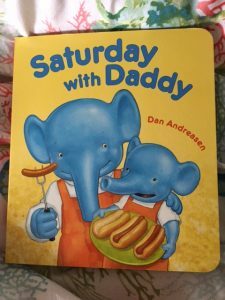 Last, but not least…Saturday with Daddy by Dan Andreasen and also published by Macmillan Children’s Publishing Group. 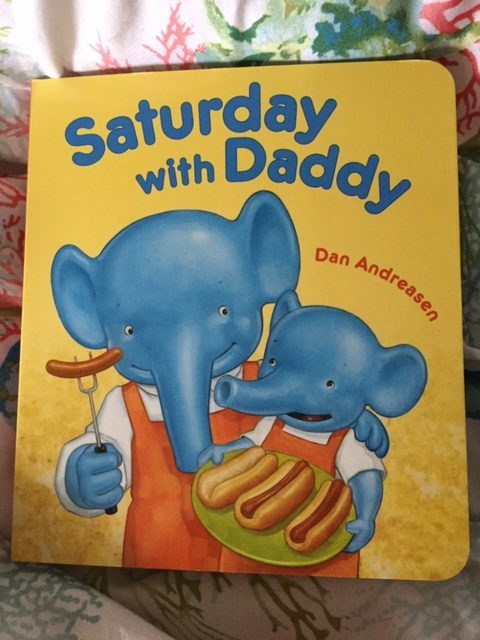 I just love these adorable Father and Son Elephants! This is such a cute book for pre-schoolers. Recommend for ages 2-5. Check out Macmillan Children’s Publishing Group for even more great books for children! Self Disclosure: I received free copies of the above books to feature this holiday!